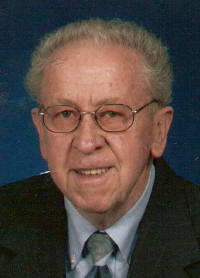 Joseph W. “Fitz” Bergmann, 78 of Bartelso, died Friday, July 9, 2010 at Breese Nursing Home. Mr. Bergmann was born April 8, 1932 in Bartelso to Leo and Elizabeth (Weier) Bergmann; they preceded him in death. Also preceded in death by a brother, Edward Bergmann, a sister, Cecilia Thien; and brothers-in-law, Ferd Thien and August Sundrup. He married Ruth Jansen on June 12, 1963 at St. Augustine Catholic Church in Breese; she survives in Bartelso. Also surviving is a son, Leon (friend Sandra) Bergmann of Keene, NH; a daughter, Kathy (Tracy) Oertel of Germantown; 4 grandchildren, Trevor and Abby Bergmann, Craig and Morgan Oertel; a brother, Lawrence (Sally) Bergmann of Alpharetta, GA; sisters, Adella Sundrup of Bartelso, Mary Ann (Jim) Gehrs of Swansea, and Lucille (Bob “Smitty”) Rickhoff of Breese; and several brothers-in-law, sisters-in-law, nieces, and nephews. Fitz retired from Carlyle Super Valu and was a member of St. Cecilia Catholic Church and a 20 year choir member and the Bartelso Knights of Columbus Council 4745. He enjoyed bowling, pinochle, Cardinal Baseball games, and especially spending time with his family and grandchildren. Funeral Mass of Christian Burial will be Tuesday, July 13, 2010 at 11:00 am at St. Cecilia Catholic Church in Bartelso with Fr. Henry Fischer officiating. Interment will follow in St. Cecilia Cemetery, Bartelso. Visitation will be Monday, July 12, 2010 from 4:00-8:00 pm and again on Tuesday, July 13, 2010 from 9:00-10:30 am at the Moss Funeral Home in Germantown. Memorials can be made to St. Cecilia Catholic Church and will be received at the funeral home.